Bread mold is a common example of sporulation, long stems rise up creating a bulb that fills with spores, these spores are then released to create new organisms. Mushrooms also release spores. 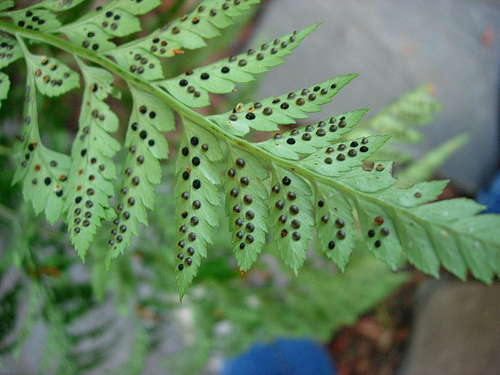 The last picture above is of a fern which is a plant that does both asexual and sexual reproduction and actually cycles between the two. The spores develop on the undersides of the leaves and the video to the right shows how these spores are actually thrown away from the plant so they will not grown directly under the parent. A spore is a unit of asexual reproduction that may be adapted for dispersal and for survival, often for extended periods of time, in unfavorable conditions. 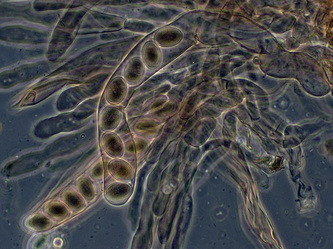 Unlike seeds, spores contain genetic information from only one parent and do not contain nutrients for the offspring to feed on. Spores can survive months or years until the conditions are right for growth.